ORMOND BEACH, Fla., Sept. 19, 2018 /PRNewswire/ -- OnSolve, a leading global provider of SaaS-based critical communications solutions, and RockDove Solutions, provider of the award-winning, crisis management platform, In Case of Crisis, have formed a connection to speed up and improve an organization's response to a critical event. Organizations can now combine the In Case of Crisis' mobile app based, shared checklists, secure chat rooms, and access to actionable plans with OnSolve's critical event communication tools, Send Word Now and MIR3. 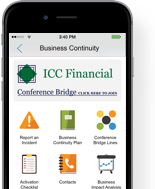 "Connecting these two best of breed solutions, allows clients and their stakeholders to manage the entire workflow of their crisis response from an app on the smartphone. In the digital age, we need to respond better and faster to an emerging crisis, this connection helps our clients do that," said Chris Britton, Chief Operating Officer, RockDove Solutions. The partnership provides organizations with the complete workflow of a crisis response from within the In Case of Crisis mobile app, including; sending alerts through OnSolve, accessing actionable plans, submitting incident reports, using shared checklists to track tasks, communicate with team members anywhere live with secure chat rooms and monitor the crisis response with situation reporting. "Finding clarity through chaos is what we aim to provide our users," says Ann Pickren, President, OnSolve. "We're thrilled to be working with RockDove on this partnership. Now more than ever it is mission-critical for organizations to have a seamless way to stay connected to their workforce, especially in times of crisis." OnSolve is a leading global provider of SaaS-based critical communication solutions for enterprise, SMB, and government customers. The company's cloud-based software communications platform provides seamless and easy-to-deploy solutions for the exchange of critical information among organizations, their people, devices and external entities with use cases designed to save lives, enhance revenue and reduce costs. More information can be found on the company's website at www.onsolve.com. Read the entire post on PR Newswire.